2018 has been a remarkable year for music, specifically within black metal there have been some releases from giants of the genre (Marduk, Venom, and Sargeist), a revival from the abyss for a few (Immortal and Dimmu Borgir), a few big name disappointments from bands I usually admire (Watain, Shining, and Behemoth) but this year has really been carried not by the household names of the genre but by generally smaller and in some cases burgeoning acts. Assessing my top albums for a year is generally an easy task in my head but this year is especially difficult, particularly as we passed the mid-way mark through the year it seemed like there was an unstoppable juggernaut of stellar releases to pummel my ears into the ground. 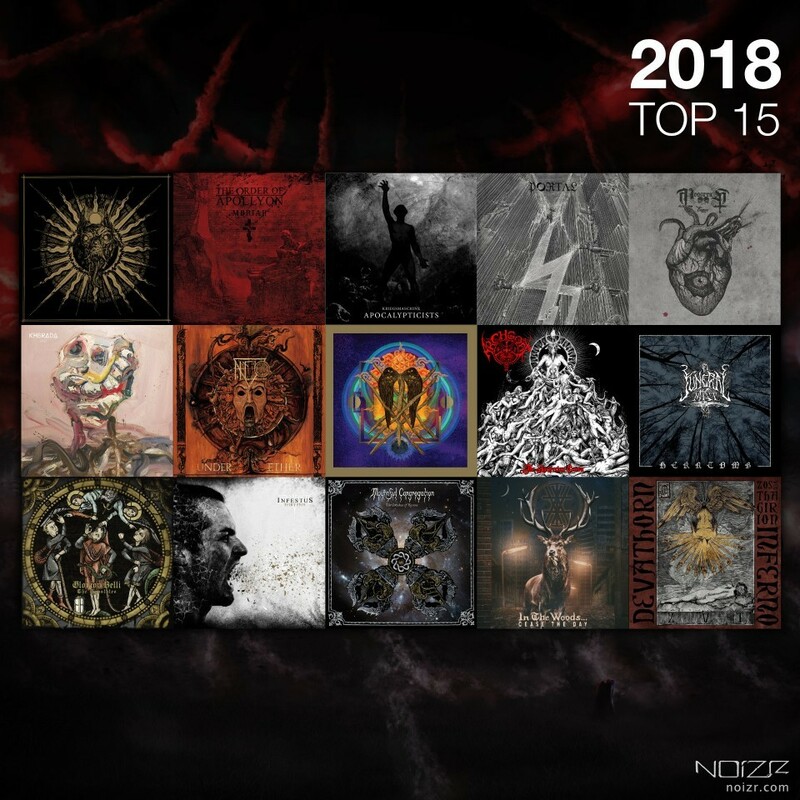 Due to this my top 10 had to be extended, I cannot in good faith omit some of these albums from recognition because they’re all worthy of praise and required listening for anyone interested in the realms of near perfect black metal in 2018. At the end of this list I’ll also be naming my favourite label of the year based around the average score of releases from this list. Occupying the bottom space purely due to its brevity, this split displays how well this format can be done when the right bands take part. Of all of the EPs and splits I’ve heard this year, "Zos Vel Thagirion" is by far the best. The funeral doom flag bearers proved once again how this very niche genre can be composed in an enthralling and mesmerising way. An album filled with ideas locked into punishingly slow tempos. Read the review of "The Incubus of Karma" here. Although many will argue (and have a convincing point) that avantgarde black metal is past its prime and has drifted into the realms of obscurity, In The Woods… proves that whilst there may not be the wealth of bands and quality to pick from in the modern age, there is at least one band that is still firing on all cylinders. Follow the link to read a review of "Cease the Day" and an interview with the band's members. In the Woods... official CD and T-Shirt giveaway details by this link. War metal is one of those genres that for the discerning listener is an easy one to dismiss, all too often everything sounds the same and it’s hard to keep track of the bands with 'Goat' in their name. Archgoat managed to build on their well established foundations and present something truly great and brutalising. Read the detailed review of "The Luciferian Crown" here. Sometimes I wonder how much more originality the French scene has to offer, as you’ll see by this list quite a lot! Moonreich have done something truly unique, an album that calls to mind so many of their countrymates and yet sounds dissimilar to so many of them, a truly special album. With the news that Virus are splitting up this year I need something varied, inspiring and a bit odd to keep me occupied. "Salt" is just the ticket; an album so honest and passionate that it’s nigh on impossible not to like. To quote Mary Poppins 'It’s practically perfect in every way'. Follow the links to read review of "Salt" and the interview with the band. A stunning album filled with variation, intrigue and surprisingly accessibility. This is the sort of album that should have been the name on everyone’s lips this year in black metal, in the same way that Mgła was the talk of the town with "With Hearts Towards None". Maybe the next album will afford Infestus with the praise they truly deserve. Read the detailed review of "Thrypsis" here. A perfect meld of stoner riffs, 'post' sensibilities and a solid foundation in black metal. On many levels this is an album that shouldn’t work but the expert way in which it has been assembled cements it as one of the best releases of 2018. Another album that I was unsure of how to anticipate, "Consolamentum" is one of the best black metal debuts I’ve ever heard, yet the follow up was slightly above average. "Under Ether" sets the record straight, and once again proves the prowess of this band; thick production and disturbing riffs "Under Ether" was one of the first albums to set the standard for this year. Read the detailed review of "Under Ether" here. As close to the perfect doom album as I think anyone’s going to get, it pays homage to its forebears, yet does its best to subvert the standard template laid out by so much of the doom genre. In much the same way as the epic "Mirror Reaper" did last year, Yob have proven there is more to doom than Sabbath and Electric Wizard worship. The best death metal record of the year by a country mile, "Ion" is the album where Portal’s manic and impenetrable style hit its stride. It’s chaotic, challenging and at times uneasy listening but there are so many riches to behold in its sonic cacophony. Read the detailed review of "Ion" here. The top 3 has been a real struggle to pick and the margins between these albums is so slight that they're all pretty much equal. This album came out of nowhere, no herald, no promo, just THERE. M. and Darkside consistently prove themselves to be some of the most enthralling musicians in black metal, they thrive on creating art and being faceless from it. "Apocalypticists" is the other side of Mgła’s condensation of black metal tropes; it displays artists that are able to be at the forefront of innovation within the genre. If Mgła shows a band who honour the past, Kriegsmaschine is the band that shows how it’s looking to the future. Follow the link to read the detailed review of "Apocalypticists". Yet another pioneering record, for all of the dross that litters black metal, with so many projects trying so hard to sound like their icons it is invigorating to hear albums that endeavour to put their own stamp on the genre. "Revelations of the Red Sword" is demonstrative of a band that are at the top of their game, the most exciting part of that is they’ve only really just started, this is their 2nd album. Read the detailed review of "Revelations of the Red Sword" here. Perhaps "Moriah" isn’t as genre bending as some of the others on this list but what it does have is riffs and solid song writing. There are so many hooks and great parts in this record that it’s drawn me back so many times because it so well composed. If Arkhon Infaustus’ "Orthodoxyn" defined black/death in the 00’s then "Moriah" makes an incredible good case for it in the 10’s. Melodic, punishing and so damn good. Follow the links to read the review of "Moriah" and an article, featuring the bands vocalist and guitarist B.S.T.. In regards to the best label, just based around this list, the award goes to Debemur Morti — a label dedicated to phenomenal music and although they’ve harboured some great acts for years 2018 is the year they’ve truly put a stamp on the genre, beyond heavyweights like World Terror Committee, Osmose, and Season of Mist. So there it is! To say 2018 has been a good year is an understatement and there are so many bands that have produced stellar content, 2019 has got a lot to live up to!